Enjoy this vacation condo in the solitude of this Highland Greens Lodge located next to the Jack Nicklaus designed 27-hole Breckenridge Golf Club. 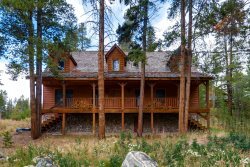 When you are ready to go explore Colorado’s Playground drive a few short miles to the slopes, town, or to shop and dine on Main Street Breckenridge at your convenience! When your day is over return to your 1,200 square foot condo and enjoy the mountain views from your private deck, warm up next to the fireplace with a good book, or unwind in the common area hot tub and sauna! Take advantage of the free private shuttle service to the slopes or downtown Breckenridge that runs daily during the ski season. The service picks up every hour from 8:00 am - 5:00 pm. An on-call service is available on Friday and Saturday evenings from 6:00 pm - 11:00 pm.